Q.1 What's the best way to prepare for moving? Q.2 How to calculate value of my shipment? Mover uses $25,000 as a minimum value. However if the shipment weighs over 5,000 lbs. the minmum value of shipment will be determined by using a formula shown below. 1. Calculated weight of shipment. 2. Using a $5.00 per pound multiple. Minimum value - 12,000 X $5 = $60,000 (customer can request a higher amount, but this will stay as minimum). 1) Free option (Release Value) - 60 cents per pound per article. This is the most economical option available; however this option provides minimal protection. Under this options, the claim is settled by the weight of the shipment. 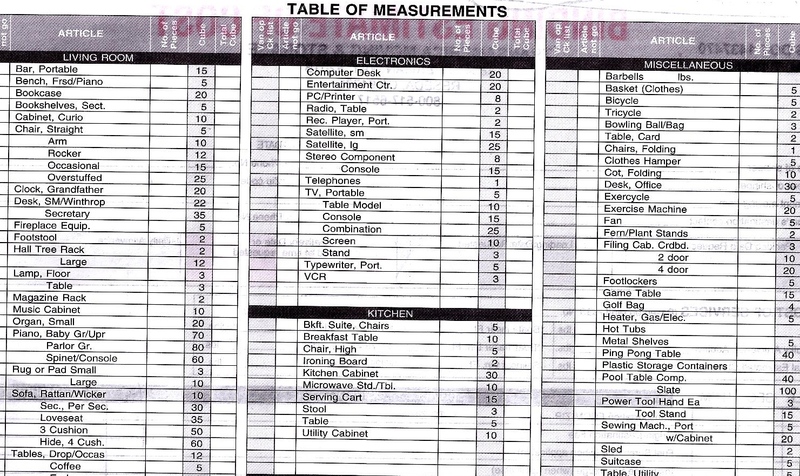 Example: A stereo that weighs 20 lbs is damaged, the mover is liabile for no more than 60 cents per pound. 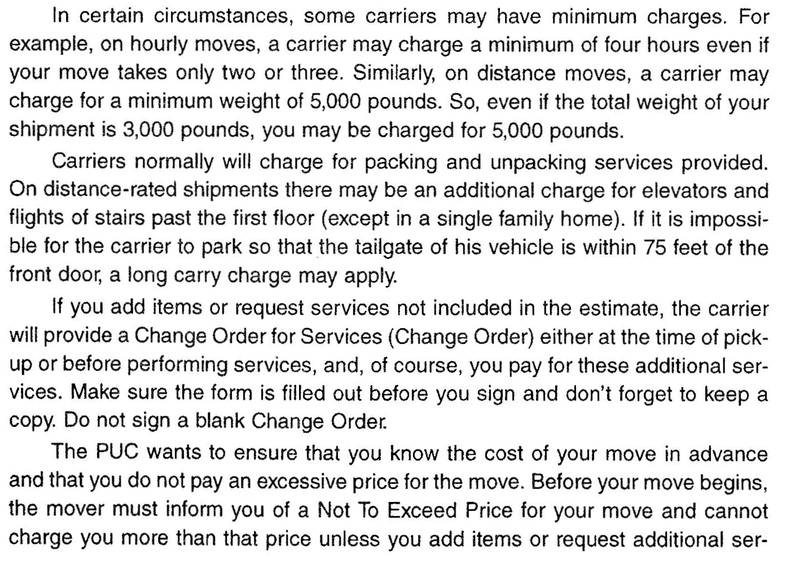 Mover's liability: 20 X $0.60 = $12.00. Customers should think carefully before agreeing to this arrangement. Pay customer for replacement article at the current replacement value. The mover will charge customers for such protection. The Cost for FVP is based on the value of your shipment (different companies have somewhat defferent ratio) will be around $1.40/100 lbs. 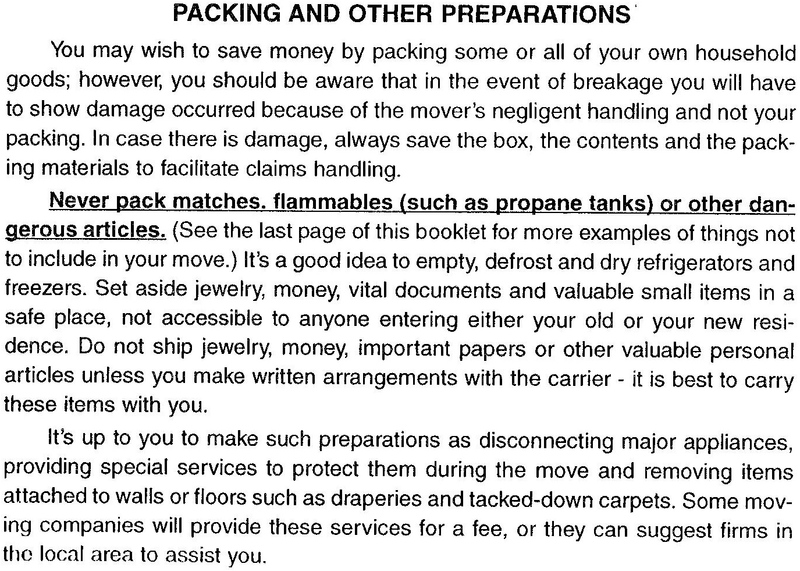 Therefore, for $60,000 value will cost -$840.00 payment to mover on bill of lading (contract). This payment purchases protection and is not refundalbe. However, the cost may vary depending on different levels of deductible levels that may reduce the cost. Movers conducting business in California are governed by CA PUC. Under PUC laws movers provide 3 levels of protection of customer's shipment. A. Basic Coverage - at 60 cents per pound per article. Recovery calculated at 60 cents times the weight. Example: 20 lbs. X 60 cents = $12.00 regardless of actual value of the item. This protection is included in movers rate. Free option. B. Actual Cash Value - this protection ensures recovery at the actual cash value (i.e. fair market value) of the lost damaged item. 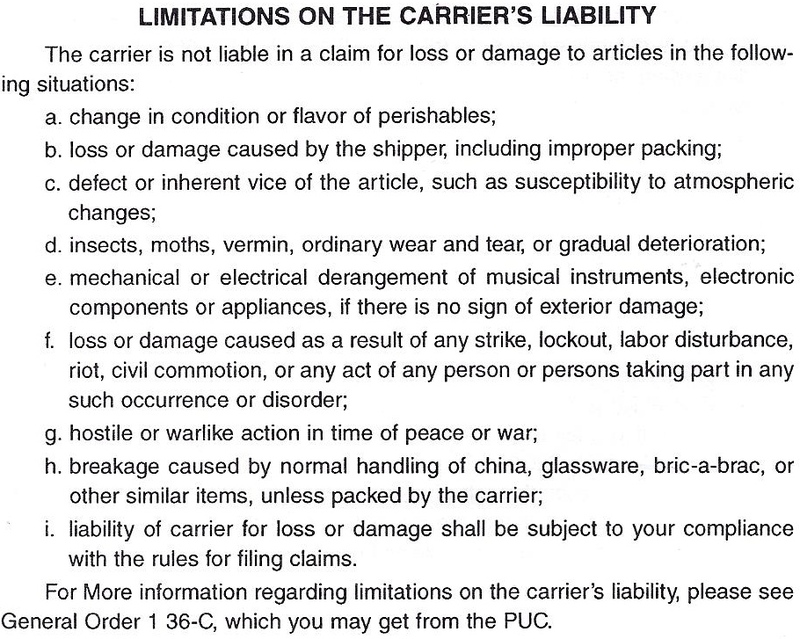 The rate for this protection will be stated on movers contract (bill of lading). The maximum rate is provided by PUC, however your mover can have the rate different but not higher than Max 4 tariff provided by PUC. Example: $30,000 value times rate of $.95/100 lbs. = $285.00 payment to mover for protection, prior to job commencement. Not refundable. C. Full Value protection ensures recovery at the full value (i.e. 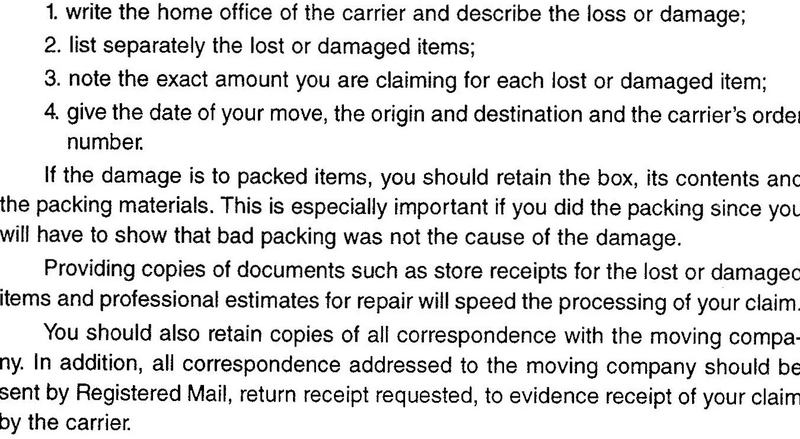 replacement value) of the lost, damaged items, up to the total value declared. 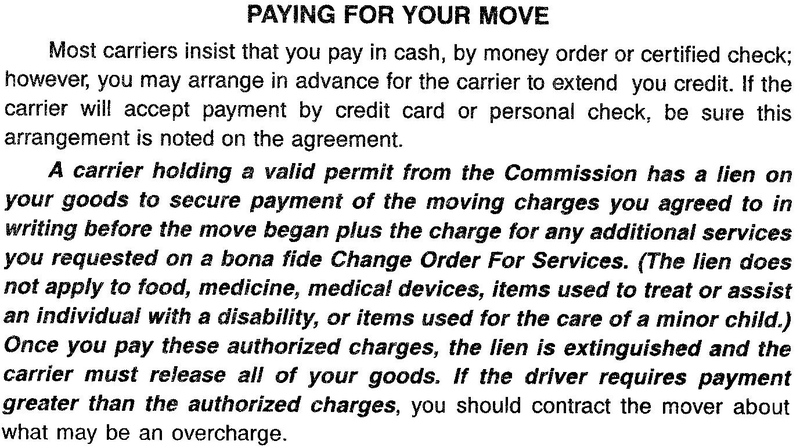 The mover may offer deductibles for this option.Customer is responsible for the deductible unless the items was lost by mover. The mover will charge for this option. Example: $30,000 protection (no deductible), rate of $1.35/100 lbs. = Cost of protection $405.00. The rates will be stated on mover's contract. Customer must choose the desired option prior to commencement of the move. 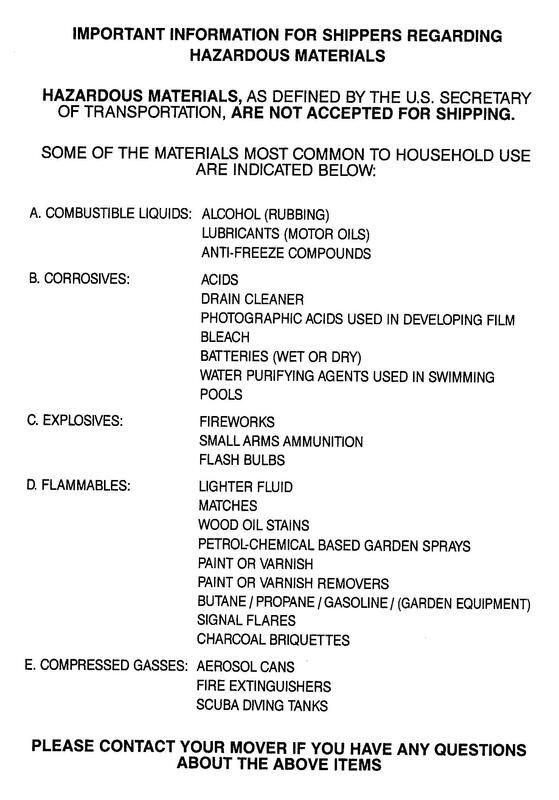 The customers are not allowed to ship any hazardous materials! No one knows the weight of their shipment, or the time it will take to relocate your belongings (unless they have recently moved). To know exact weight of the shipment the truck will be weighed twice before and after loading for long distance; and the time will be kept during your move on your move day. However, Oxnard Movers Inc has a team of experienced estimators, whose job is to go to client's homes and take a very detailed inventory of items to be relocated. Customer should be very specific as of which items may or may not go and the conditions at both locations: long walks, shuttle, stairs cases, elevators, etc. The more movers know ahead of time the more accurate their estimate will be. Estimators use state issued estimate form which has a "Table of Measurements". Each items is assigned a specific size. Even though no items is always the same size, it tends to average out with in 5% to 10%. Therefore, estimator will slightly overestimate the size to protect the company, and not to turn off the customer's interest. Be aware of movers that "low ball" the cost, with out actually seeing your place. 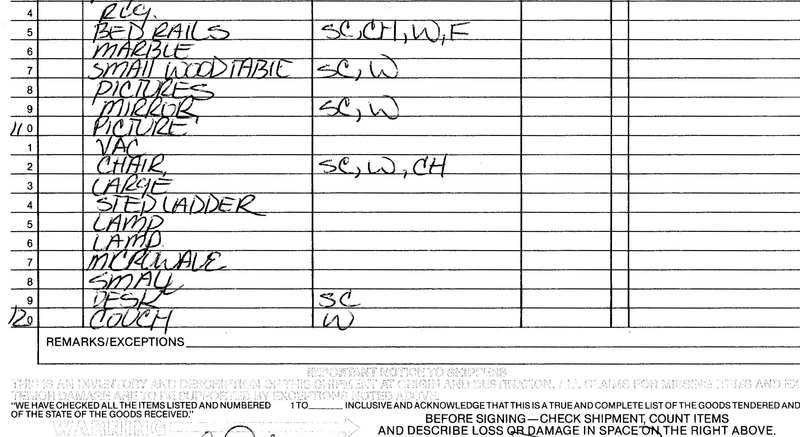 Here is a form used by estimators to determine the size of the shipment. Each items is assigned a size. After careful inventor estimator will determine the size of shipment with in 5-10% or actual size. On the day of the move the shipment will be weighed to protect customer from being overcharged. We strongly recommend not to transport currency, bonds, stock certificates, precious metals, jewelry, etc. Those items that have to be shipped must be logged into a special form "items of extraordinary value". Professionals should pack the fragile, expansive, bulky items. Customers that want to control the cost may pack some non-breakables. Such as books, files, etc. - Keep the weight of your boxes reasonable. If possible, put heavy items in small boxes to make them easier to carry. - Don't apply tape directly to polished or painted wood finishes. Removing the tape could ruin the surface. - Double-box fragile items and add plenty of cushioning. Use special boxes for fragile items, such as Dish Packs. Don't over load boxes. Q.9 What items does mover have no liability over? Generally movers are liable for most of the shipment they are transporting locally or long distance. However, there are some circumstances in which movers have no liability. Make sure to supervise movers at the time of loading and unloading. The movers will be tagging and logging items into inventory form. The numbered item will go into appropriate line and its condition will be described next to it, at pick up and on the day of delivery items will be off loaded and checked off as well as their condition. If there are any scratches, damages or missing items, make sure to log it in the inventory. 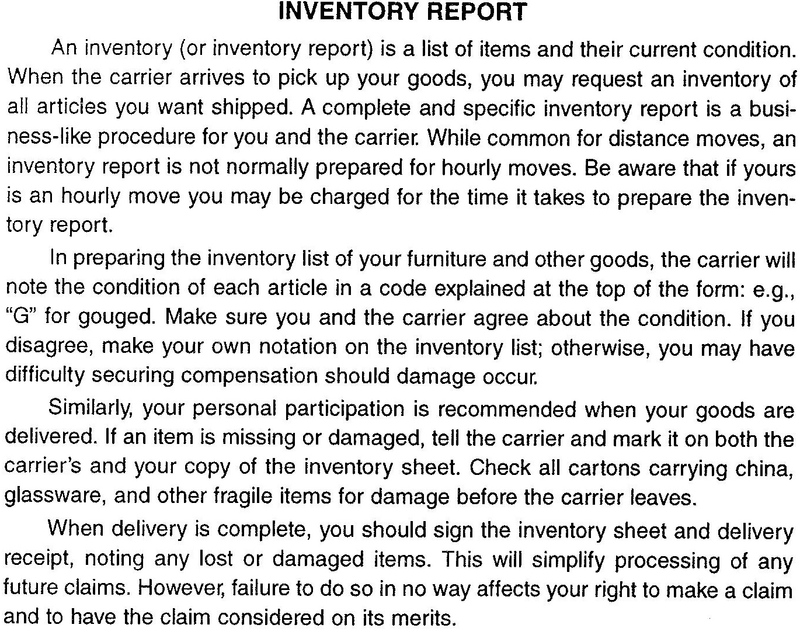 It is not official claim, but if you need to file a claim an inventory report will help. Here is a copy of a real inventory report, names are blocked out for customer's privacy. For long distance relocation or relocation going into warehouse, movers tag and inventory every item and its condition onto inventory form. Both customer and a mover sign it after load and after unload. Any scratches, or dent, regular ware and tare is marked on the form prior to load, and then any moving related damages or loss will also be marked on the forms. Q.11 How do I file a claim? This is a page out of a PUC booklet with exact explanations of how to properly file a claim. Q.12 How do I pay for a move (local or long distance)? Local move is paid upon its delivery.Oxnard Movers Inc. takes a booking reservation deposit by credit card of $100.00 it will be deducted at the end of the move off the total cost. Long distance moves customers pay a reservation deposit of $250.00. On the day of pick up customer pays a 50% of estimated amount, and upon delivery customer pays the balance of the estimate and any extra services may have had to perform, which were explained to customer and signed in the order for service form. In California long distance moves are charged by the weight of the shipment only. The truck must be weighed twice befor and after the loading. This is considered the more honest way. As regardless of the company client uses the weight will always be the same. Unlike the size - cubic feet of shipment, may vary due to the professionalism of movers of how tight it is loaded in the trailer. Federal government - US DOT allows both ways of charging customer, as long as the tariff is properly posted and readily available to customers. Oxnard Movers Inc uses a tariff based on the weight of shipment. There are many different circumstances due to which the customer may not accept their shipment. Escrow, not found a place, loan falls through, remodeling takes longer than anticipated. For those customers we offer short term storage (90 days or less). Appliances do require special attention prior to a move. Mover's job is to take appliance cover it from facial damages, and transfer to new residence. The customer has to service appliances by themselves, or hire a professional appliance technician, or let mover know and the mover will send our partner reputable appliance tech. The fees for service will be added to the contract. • Wash removable parts such as shelves and drawers with a mild detergent or in a solution of warm water and baking soda. Ice trays and ice storage bins should be washed in lukewarm water only. • Glass shelves should be removed, cleaned and movers will carefully pack them in carton for protection during transit. • Be sure the appliance is totally empty and clean. If not cleaned before transit it can develop an unpleasant, permanent odor, making the appliance unusable at destination. 20 Boxes Per Bundle - size range of (15" x 12" x 10"). WOODEN CRATES - made for specific articles, our estimators will take measurements and crate will be assembles in a short amount of time.